(Editor): What is your current position on the Executive Committee? And how many years have you served on the committee? (Brett): Board member for the class of 2017. 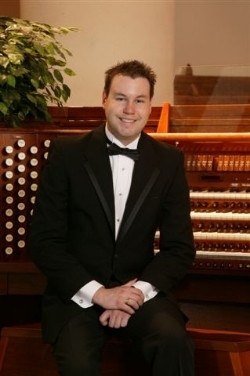 (E): Do you currently serve as an organist/music director in Wichita? If so, where and how long? And do you have any other jobs? (E): What was your educational experience? (B): Wichita organ study with Anna Jeter, Wallace Dunn, and Robert Town. Further study with Dan Miller, Lyn Larson, Tom Hazelton, Clark Wilson, John Giacchi. No music degrees. 2- year degree in Mortuary Science. (E): As a member of the executive committee, what would you like to see the Chapter do this year? (B): The use of the organ in churches continues to decline across the nation. The guild presses on and stays in place for the churches and organizations who continue their tradition. The Wichita Chapter should continue their work and stay strong! (E): What is one of your best memories of a Wichita Chapter AGO event? (B): I first joined AGO when I was 12 years old. The first event I went to was a large gathering in September, the beginning of the new season. Until that time I thought I was alone, or nearly alone, in my love for the pipe organ. Seeing a gathering of people who shared the same love was incredible.